Our elegant and durable hardtop gazebos and pavilions will add utility to your garden year-round as a cool retreat at summertime, a smoking shelter at wintertime or a private getaway. Palermo Garden Gazebo has been fashioned to deliver elegance and utility to your garden year-round. .. 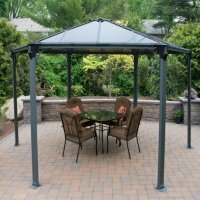 The Monaco Garden Gazebo allows you to turn your outdoor area into a roomy gathering space, an addit..